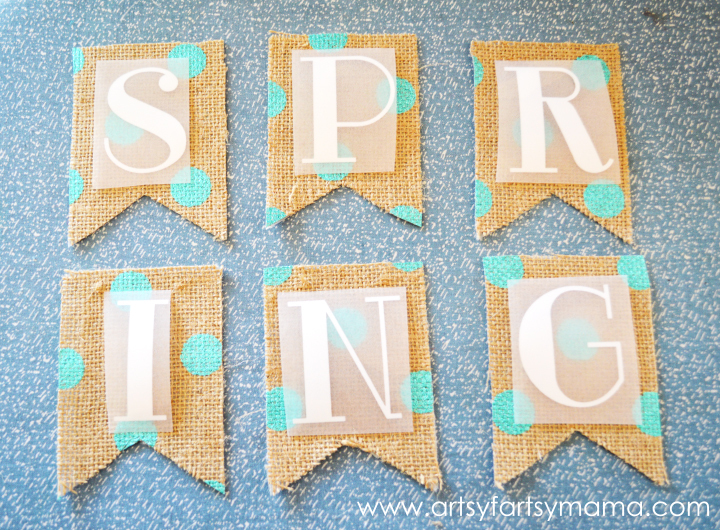 Spring is officially here, so that means it's time to get those springtime decorations up at my house! I don't have a whole lot of decorations, so I decided to make myself a banner since I have never made one before (I know, right?). But, with the help of my Cricut Explore and some stripflocked heat transfer vinyl from Expressions Vinyl, this banner was a snap! 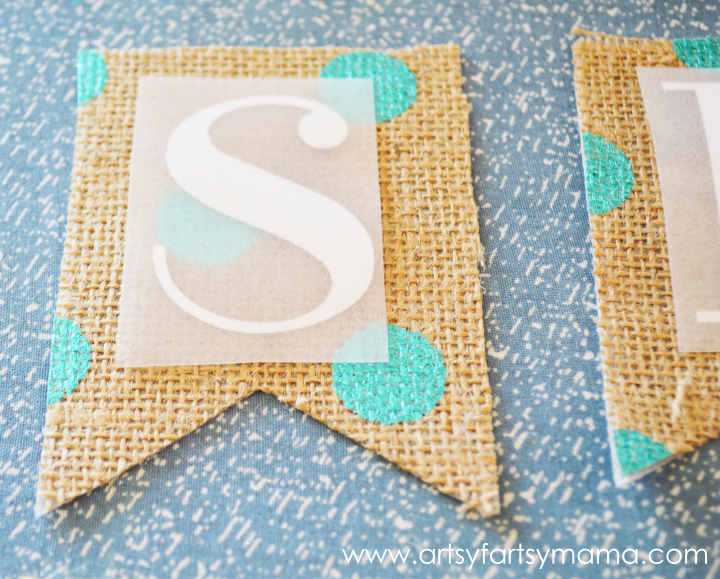 Generally, I stay away from burlap in general because #1 I hate how it feels. Really hate it. #2, it gets everywhere!!! It's like the feeling after a haircut with tiny hairs poking you, but all.over.the.place!! ughh... But then, I found this adorable polka dotted burlap at Joann's that I just couldn't resist. Did you know that the Cricut Explore can cut fabric? More specifically, burlap?! I ironed on some fusible interfacing to the backside of the burlap for both stability and placing the burlap interfacing-side down will help keep your mat from being covered in burlap whiskers. I cut out a 12x12 piece and placed it on a standard sticky mat and cut out the banner shapes with the Explore. *If you don't have an Explore, don't worry - you can cut out a banner shape out of cardstock and trace the pattern on the burlap to hand cut. After cutting out the stripflock heat transfer vinyl, I weeded out the excess vinyl and separated the letters so I could iron them on the banner pieces individually. The difference between regular heat transfer vinyl and stripflock heat transfer vinyl is that the stripflock has a fuzzy texture instead of the glossy, vinyl texture. To cut the vinyl, place the sheet liner side down on the cutting mat. Cut the sheet with a "kiss cut" (where you only cut through the iron-on, but leaves the liner intact). Every cutting machine is different, so make sure to check your cut guides and settings. Place your letter, liner side UP onto the area. If you don't place the liner side up, it will stick to your press cloth. Carefully lay a press cloth, piece of scrap fabric, or dishtowel over the design. Be VERY careful. You don't want any of the pieces to shift! Next, I punched out two holes at the top of the banner pieces with a paper punch. Weave some twine through the holes, and your banner is now ready for display! Who else is ready for Spring to finally be here?! 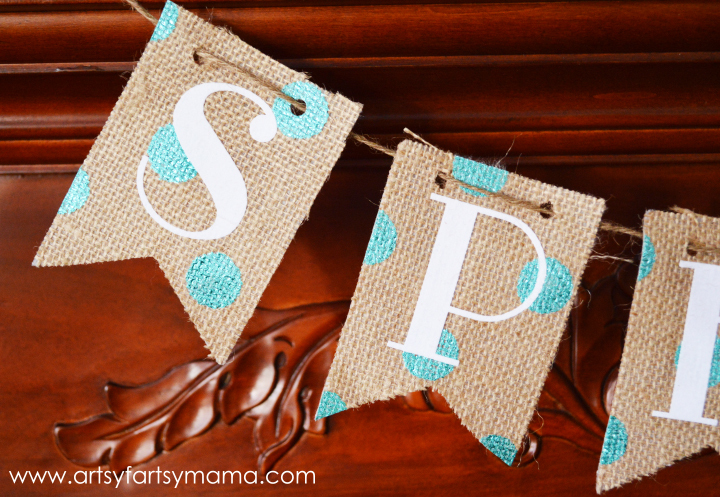 I received product from Expressions Vinyl and Cricut in exchange for this post. All opinions are my own. Very cute! 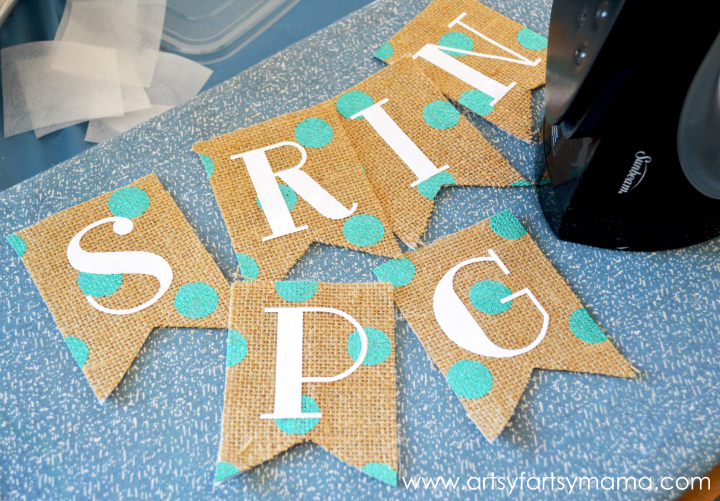 I have this burlap and want to try this now! Thanks for sharing!! Lindsay, I LOVE this banner! How do you like your new Cricut? Expressions Vinyl is awesome, right? I have a huge fan of their store and shop frequently! Love the banner, it is so bright and fun!